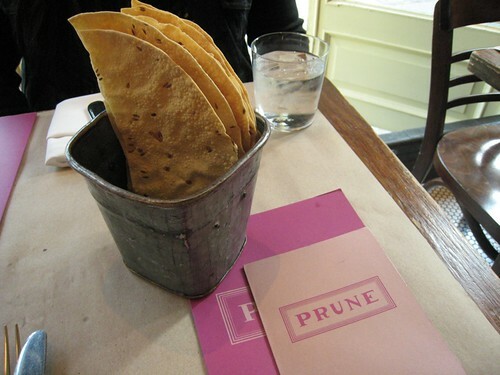 I'd passed Prune a million times but had never gotten around to actually eating there. RZ was game to check it out, and after not seeing her for almost a year, it turned out to be the perfect place for a weekday girly catch-up date. The place is cozy and bright, with a friendly staff and a playful vibe. None of the main dishes appealed to us, so we asked our waiter how we ought to manage our selections. He assured us that getting two appetizers and a vegetable from the main menu and a few small plates from the bar menu would be just fine, so that's what we did. But when our trio from the bar appeared, I knew we were in trouble. 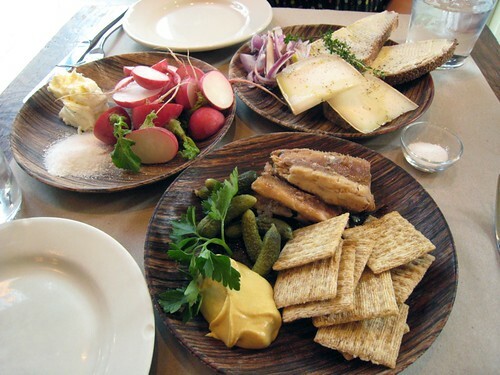 What came out—radishes with butter and salt; sardines with triscuits, cornichons, and mustard; Spanish goat cheese with buttered brown bread and red onions—was far more than I expected. I was totally charmed, though; everything just looked so rustic and agreeable. Eating the fresh radishes and butter—which I'd never tried—made me understand the appeal of the ruddy little globes at last. They were crisp and spicy, and when paired with a smear of creamy butter and a sprinkle of salt, were refreshing and decadent at the same time. I hadn't eaten sardines before either; my only knowledge of them was that they were small and came packed in their proverbial cans. 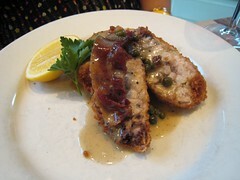 The fat, meaty filets we were given weren't anything like what I had imagined, and in a good way. After these three I was already near-full, but the march had to go on. 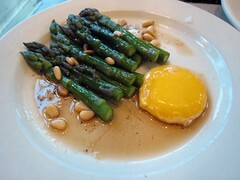 So out came the tender asparagus tips in browned butter with an egg yolk, and huge fried sweetbreads with bacon and capers, very different from the ones I had in New Orleans. 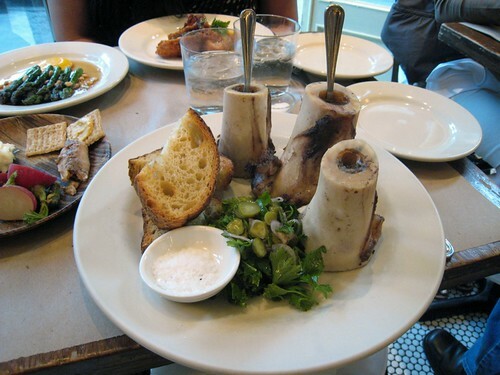 Followed by roasted marrow bones. The tall tubes seemed enchanted—each was an endless well of smooth, unctuous, beefy fat. The vinaigrette-slicked salad of parsley, capers, cornichons, and pickled red onions was just the right accompaniment to keep the marrow from being too crazy rich. 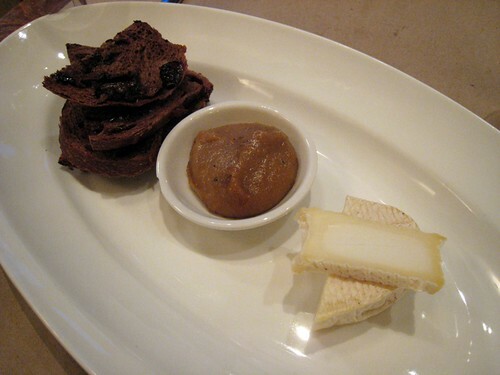 Dessert was an odd concoction of chocolate-cherry bread, raw goat's cheese, and a weird pine nut butter which somehow tasted like pork fat. All together or in various combinations, none of the three seemed to quite work together. I was happy to just eat the excellent cheese by itself, but also so stuffed at that point I was beyond real enjoyment. Prune is a place I could easily imagine being a regular spot. The food is unpretentious and delicious, the environment delightful and welcoming. Our check arrived with two chubby hunks of dark chocolate sitting on top, just for fun. Since both RZ and I were mourning the fact that Prune was out of their monkfish liver with buttered toast that night, it's only a matter of time before I head back! looks derishious, how much was your meal total? Maybe 70 or 80 total? Including one glass of wine. It was totally not bad. roasted marrow bone? restaurants actually serve this? thats great! i've always liked the taste and texture of it. never regarded it as real food though. now i know!